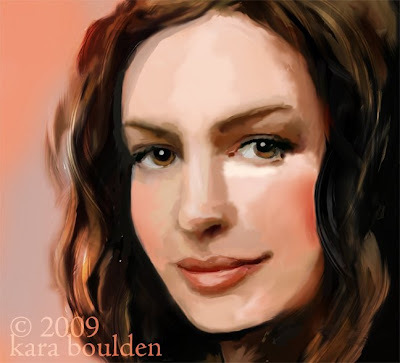 I wanted to draw Anne Hathaway because she's really pretty, and sometimes, it's just fun to draw pretty people. Other times I have the desire to draw the old, strange, or big. But, not today. I love Anne's huge eyes and mouth, they offset the rest of her face, make her a bit less, (or is that more?) perfect. I don't know if this looks like her in the end. 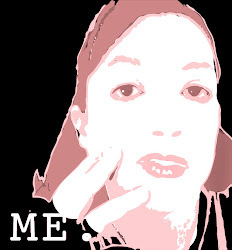 I got rid of my referrence picture part way through creating this and did my own thing; so, it may look less like her that it could have, but that doesn't matter. I like the final product I came up with. I think her hair is interesting. I like how the light from the side of the picture lights up and colors certain parts of her face. I like the smooth areas mixed with little areas of lots of color and paint dabs. I wanted to come up with a painting that looked Renaissance smooth, I love how so many portraits from that period are so smooth, they are so pretty. But no matter the actual outcome, this has been a really restful picture to work with, so that's reward and success in and unto itself.